Are you wondering if you should visit the Galleria Borghese when you come to Rome? Find out why this is one of Rome's must-see museums, and all the tips you need to know about visiting it. Want to book tickets for the Borghese Museum now? Entry times are 9-11am, 11am-1pm, 1-3pm, 3-5pm or 5-7pm. On Thursdays there is also a 7-9pm slot. The park is enormous, and you can visit all the rest of it without visiting the Galleria Borghese. But to see the small gardens inside the Galleria Borghese, you will need to book a visit there. Based on my own visits to many of Rome's museums (several times over) over the years, if I had to pick only one museum to visit on my trip to Rome, it would be this one. Sacrilege you say? Not the Vatican Museums? REASON 1: Some of the most exquisite (and famous) works by these two masters are in this museum. Honestly, look at this statue. Don't you want to see it up close and personal? 2. One of the best collections of art in the world! REASON 2: The museum has one of the best collections of art in the world in terms of sculpture, painting and architecture (the building itself is one of the attractions.) And it's all in a space that is visitable in the 2-hour time allotment you have. REASON 3: They only allow 360 people into the museum at once, so even if it can feel sort of crowded when everyone is gaping at one of Bernini's statues all at once, it really is not that crowded. Nothing like the Vatican Museums with its 30,000 visitors per day. REASON 4: I can see layers of history in the form of art and architecture in a relatively small and manageable space: Floor mosaics from ancient Roman villas showing gladiators and their kills; ancient Roman sculptures, Egyptian art, Renaissance paintings by some of the masters like Raphael and Titian, and some of Bernini's most famous and loved sculptures. REASON 5: The museum is in the Villa Borghese park, making a walk there (and back) a lovely experience. Depending on the season, you may even want to visit the gardens of the museum itself as well. What is the Borghese Gallery and What's to See? In the 1800's, another Camillo Borghese, who was actually a prince, married into the Bonaparte family (his wife Paolina is the one seen reclining in Canova's spectacular sculpture, seen in the photo just below.) During this time, Rome was under French rule. In 1902, the Borghese family sold the villa and its contents to the Italian state. This sculpture of Paolina Borghese by Canova is one of the most breathtaking pieces of art in the museum. Don't you feel you could lay down on that marble mattress? What can I say, I am a sucker for pretty much anything Bernini has ever done. OK make that everything he has ever done. Aside from the fact that three of his most important sculptures are in this museum . . .
. . . there are many more works by him, including a self-portrait (painting), a fascinating sculpture of Aeneas fleeing Troy (this is the beginning of the Rome foundation story! )...and even a sculpture he didn't finish. Michelangelo Merisi, otherwise known as Caravaggio was a master of chiaroscuro, which means using very light colors against a dark background, for maximum effect and contrast. He perfected this style and is considered one of the best and most well-known artists in using it to create a strong atmosphere in his paintings. I can't really do justice to paintings by Caravaggio on a web page. First of all, nothing is like seeing them yourself. Second of all, it's not easy to take a good photo of a museum painting. The angle and lighting are usually off. But here are some pics I took, just to give you an idea. John the Baptist by Caravaggio in the Galleria Borghese - so special and unusual to see him as a young man! You will find paintings by Rubens, Raphael, Guido Reni, Domenicchino, Parmigianino, Correggio and so many more. It's worth spending the whole 2 hours in the museum and really soaking up the beauty all around you. Here is everything you need to know about tickets to the Borghese Gallery - what they cost, how to reserve, how to use the Roma Pass to visit for free, and what tours are available. Reservations are A MUST to visit the Galleria Borghese. I don't mean, I think you should book. I mean, it is obligatory, according to the museum's website and rules. Even for free tickets such as on the Free Sunday (first of every month between October - March), for Roma Pass holders, and for children under 18. Tickets to the museum cost 13€ for adults, and are free for anyone under 18. The museum is also free the first Sunday of the month. The rules about the "Free Sunday have changed. See below. There may be additional costs if there is a special exhibit going on. To pre-purchase your tickets, there is a 2€ fee. So even if you book for an under-18 year old, or for a free Sunday, you will pay 2€ for the reservation. The exception is that handicapped people and their caregivers do not pay a reservation fee. But there is also a new pricing reduction rule as follows. 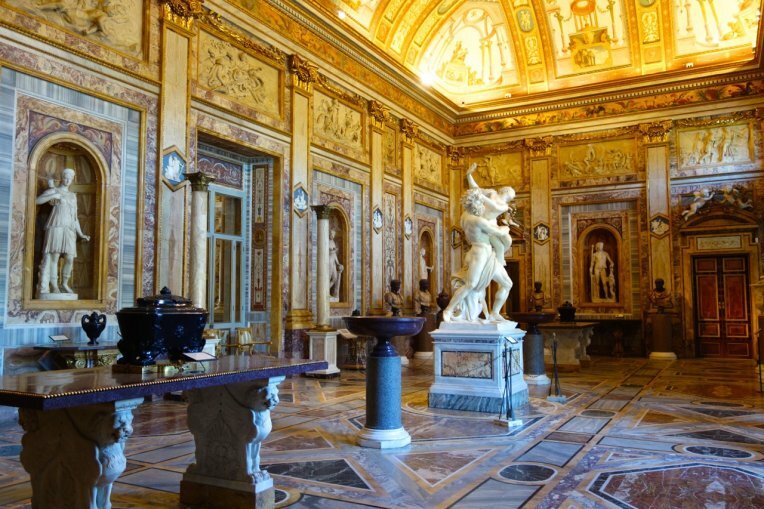 The Borghese Gallery is one of the sites available to visit with the Roma Pass. You may visit this museum as one of your "free-entry" sites, but you still need to reserve. There is no reservation fee when you use the Roma Pass to book and visit the Borghese museum as one of your free-entry sites. If you are using your Roma Pass to visit the Borghese Gallery at a reduced rate, i.e. you have used the Roma Pass for free entry to other sites, then you will need to pay the reduced rate, and also the 2€ reservation fee. The reduced rate for the Galleria Borghese for Roma Pass holders, when not visiting the museum as one of the primary free-entry sites, is 8.50€ during special exhibits and 6.50€ when there is no exhibit. There are some ways to visit the Galleria Borghese for free. If you are on a budget, this can be a great way to save. Just know that for most of the free visits, there is still a 2€ charge to reserve, and most of the time, you need to reserve. For every site, you need to check for the free dates. You can do this by visiting the website dedicated to this, run by the Beniculturali, and typing in the name of the site or monument, but you have to enter it in Italian. The site is not in English. So for the Colosseum, for example, you need to enter "colosseo". We used to have the "Free Sunday", in which state sites and museums, Galleria Borghese included, were free for everyone on the first Sunday of every month. As of spring 2019, there are new rules. We still have the free Sunday from October - March inclusive. From April - September inclusive, the busiest months, we do NOT have the Free Sunday. On the other hand, every state site and museum is now free to decide how to allot the total 22 days of free entry per year. Here are all the free dates at the Galleria Borghese in 2019. Note that for some dates, only certain times are eligible for free entry. And you still need to book! Who is eligible for Free Entry to the Galleria Borghese? For more specific details about who is eligible for free entry, and more info, visit the website of the Rome Tourist Board for the Galleria Borghese, which seems to be the only official site currently available in English. Do you need to book tickets in advance to visit the Galleria Borghese? They only allow 360 people at once in the museum, every two hours. And for most of the year, you will need to book in advance. Sometimes a day or two in advance, sometimes weeks in advance. In low season, you can usually reserve a day in advance, and sometimes even the day of your visit. But even in low season, you need to reserve. There are now 3 ways to book the museum, via phone, online, or by e-mail. Unless you have a Roma Pass, you must pay for your tickets during the reservation process (whether you book by phone, e-mail, or online). If you have a Roma Pass, and want to use it to visit the Galleria Borghese, you still need to reserve. And as a Roma Pass holder, you may reserve by phone or e-mail. You will have the choice to speak to an operator in Italian or English. The phone ticket office is open Monday - Friday from 9am until 6pm, and Saturday from 9am until 1pm. It is closed on Sundays and holidays. Be ready to book with either a receipt of your Roma Pass or the actual pass, or, with credit card (Visa or Mastercard only), and have something to write with. Once you book, they will give you a booking code. They may ask for your email address so they can send you confirmation via email. Regardless of how you reserve, either with credit card or with Roma Pass, you still need to pick up your tickets on the day and time of your visit. Now, you can book the Galleria Borghese via e-mail. This is probably a much easier way to go than via phone. Remember, if you are reserving with the Roma Pass, there is no fee. You can book the Borghese for free if you plan to purchase the Roma Pass, even before purchasing the card. Send email info@tosc.it. Don't forget to include the number of people, their ages, dates you want to book, and preferred time. Also make sure to give them an easy way to reach you if the email you send from cannot be used. When booking via e-mail, you'll receive confirmation within 48 hours. N.B. - June 2018 - Please note, this is a new way to book the Galleria Borghese, so it may not be a perfect system yet. If you have trouble with email, or don't get a response, then revert to the other ways of booking. If you go to the Borghese website, (currently unavailable in English), and click to book tickets, it will take you to their official ticket vendor affiliate in Italy, which is TicketOne. It seems the only link from the website is to an Italian page, with no option for viewing the page in English. I've done the browsing and hunting for you. Here is the booking page for the Galleria Borghese on TicketOne in English. You select the date you want, the time slot, number of people etc. Once you are ready to pay, you will see there is a fee to use that website/vendor, which is an additional 2€ per person. You will need to create a login name and password, but it's fairly straightforward. As I just pointed out, the online booking agency used by the Galleria Borghese (and many other Rome sites, museums and events), is TicketOne. It's in Italian but can be viewed in English by clicking the language flag top right of the screen. But you need to create a login. I have heard more than one person tell me they find this website frustrating and/or difficult to use. Do you just want to book your tickets via an English-language website and be done with it? Here's an easy online booking calendar. The tickets cost just a bit more than using TicketOne, but it's an agency and that includes the ease of use and your peace of mind. You are only allowed a 2-hour window for your visit. But you need to be there at least half-hour before your entry time. You may also spend a little time afterward visiting the (very small) gift-shop, having a coffee in the bar there, or even walking around the gardens. Figure in time to get to the museum (this of course depends on where you are coming from, and how you will get there). So all together, I'd say count on a good 3-4 hours out of your day. My top recommendation for a guide to this museum is to do their audio tour. You cannot book this in advance. You just get it on the day you visit. The audio tour is 6€, and is self-guided. It's really well-done and has good narrators telling interesting history about specific important (numbered) pieces throughout the museum. There is no order, so you just go at your own pace and start where you want. Very highly recommended. Alternatively, you may book a guided tour of the Galleria Borghese with one of their docents, for 6.50€ per person. You must book this when you book your tickets. You have the choice of a docent who speaks English or Italian, and sometimes (but not always) several other languages are also available, including French, Spanish and German. You may also opt for a guided tour of the museum. There are several options for guided tours, including a having an art historian, a family-friendly tour, and a tour that also covers more of the park and the top of the Spanish Steps. They say to arrive 30 minutes prior to your entry time. But actually, you should get there 45 minutes before-hand. Consider that everyone is told they need to arrive half hour prior to their entry time. So it will be crowded right then. And you have things to do before you enter: pick up your tickets, check any items you are carrying, possibly arrange an audio or docent tour, have a coffee, use the restroom etc. So give youself that extra time. Because at the end of your 2-hour visiting time slot, you will be OUT of the museum. You will need to check anything you are carrying (purses, cameras, backpacks, camera cases, umbrellas but NOT coats or jackets.) This is free but there is always a line, although it moves pretty fast. Even really small bags need to be checked. A large camera case needs to be checked, but it's ok to go in with a camera around your neck. Don't worry, they will give you a little plastic baggy to put some change and your phone in. Speaking of cameras - the website says no photos are allowed, but on a recent visit, everyone, including yours truly, was snapping away, with SLR cameras and phones alike. I didn't see any "no pictures" signs anywhere, and although there are plenty of museum guards, nobody said anything to the people taking pictures. I think a good rule of thumb is no flash. If you go at 17:00, you will finish at 19:00, and this is also the exact time they close the gift shop. So if you go at the end of the day, and think you might want to purchase anything in the gift shop, take time to visit the shop before your appointment, or try to leave some time at the end of your appointment, say 18:50, to get to the shop. They only allow 90 people at once into the paintings galleries on the top floor, and in theory only for 30 minutes max. I recommend that when you arrive at the museum and are downstairs getting your tickets, checking your bags etc, that you STAY there, and go to the entrance in the way back, and go up on the top floor to begin your visit. In this way, you will start first in the paintings galleries, ensuring you will be able to visit them at a leisurely pace. Then, you can go down to the main floor when the other crowds are moving up to the paintings galleries. The museum will be nearly empty about half hour before your time slot is up. Even though I personally take every minute I can get in this museum, for a lot of people, it seems 60-90 minutes can be enough. So in the last half hour of your visit, you can go back and have virtually any room or piece of art to yourself. Wondering where to have breakfast, lunch or dinner before or after your Borghese museum visit? There used to be a café inside the Galleria Borghese. At this moment it is closed. Supposedly they are adding a new dining space. Stay tuned. This cute outdoor cafe is on Piazzale delle Canestre inside the park. It's about a 10-minute walk from the museum. It's actually really good food, including the pasta and pizza! It's also nice to sit outside and have little birds come join us. Love eating lunch when little songbirds come hang out by you! Not far from the museum (maybe a 10-15 minute walk) you will find one of our favorite pizzerias, Pizzeria San Marco. You can eat inside or out, and have just about anything from pizza to salads to pasta to fish. They have also recently opened a Japanese sushi place just next door. I haven't tried it yet but if you are in the mood for sushi, this could be a good spot. Via Sardegna, 38/g. Open daily from 10am - 1am. Phone: 06 4282 4893. Reservations suggested.